The Myra Canyon Trestle Resortation Society reports that "All trestles destroyed by the Mountain Park forest fires of 2003 have been rebuilt to historical specifications using British Columbia wood and labour." and that it is now possible to travel over the 12km route between Myra and Ruth trailheads. Myra Canyon is spectacular. 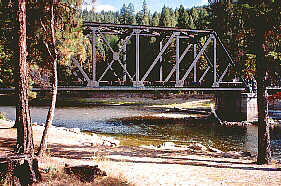 Sixteen trestle bridges cross along this13 km ( 8 mi.) stretch of railroad. This is an ideal hike, especially in the spring or fall. 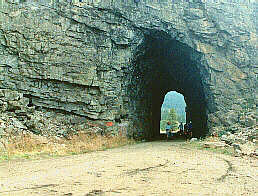 This section of the KVR is the best example of railway construction of the early twentieth century. 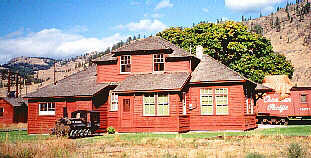 The trestles have been rebuilt to historical specifications using British Columbia wood and labour after a wildfire destroyed the original structures in 2003. To access Myra Canyon by vehicle, take KLO Road to McCulloch Road, follow McCulloch Road past Gallaghers Canyon Golf Course, until you reach Myra Forest Service Road. It is marked with signs. Follow that road 8 � kms to the rail bed and the Myra parking area. Avid cyclists may wish to access from the June Springs entrance on the west side of the Canyon.